SEOUL, Nov. 14 (Yonhap) — K-pop boy group EXO has reached the 23rd spot on the Billboard 200 albums chart, the group’s highest ever, with its latest LP, according to data released Wednesday for the week ending Nov. 17. The chart performance of “Don’t Mess Up My Tempo,” released on Nov. 2, is the highest ever achieved by any K-pop group except for BTS. It is also the group’s personal best yet on the chart. “EXO prove they are far from slowing down as their new album Don’t Mess Up My Tempo scores the boy band their first-ever Top 40 entry on the Billboard 200 as well as a slew of new, high-flying records,” Billboard said on its website. The album rose atop on Billboard’s World Albums chart. The group has recently achieved a major milestone in the Korean music industry with more than 10 million cumulative album sales. Among K-pop artists who debuted after 2000, EXO is the only one who has set the record. All five of its LPs have sold at least 1 million copies. 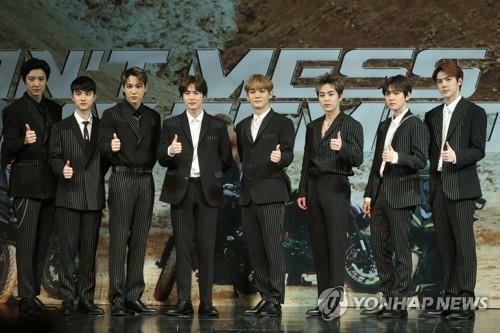 The latest one, “Don’t Mess Up My Tempo,” had sold 1.17 million copies as of Sunday.